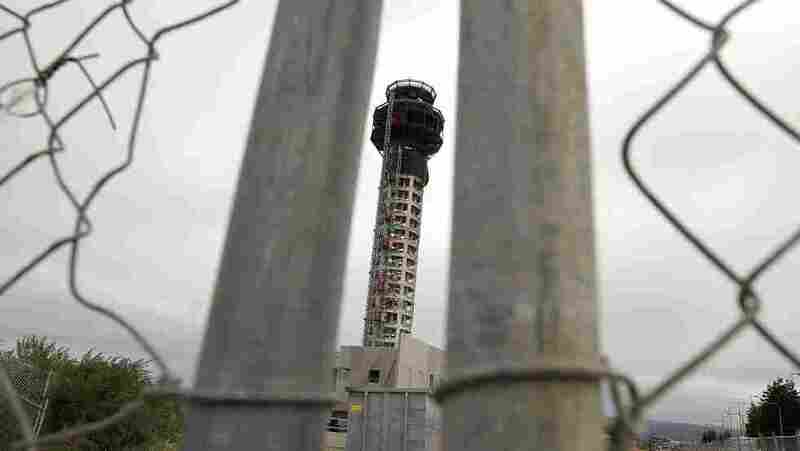 FAA Operations Up In The Air Amid Shutdown Congress did not clear the bill authorizing the Federal Aviation Administration before it left for recess. The agency's partial shutdown is another thing adding to the country's debt. This month alone, it will cost the Treasury $1 billion in uncollected airline ticket taxes. Disputes in Congress over labor issues and subsidizing small airports are behind the standoff. A partial shutdown of the Federal Aviation Administration, prompted by a political dispute, is adding to the country's debt. This month alone, that shutdown will cost the Treasury $1 billion in uncollected airline ticket taxes. The shutdown is happening because of a labor dispute, a long-standing rivalry and a disagreement over subsidizing small airports. It's not clear when it will all be resolved now that members of Congress are leaving Washington, D.C., for their summer recess. NPR's Renee Montagne talks to NPR's Brian Naylor about what's behind the standoff. Renee Montagne: First off, we understand the FAA is running air traffic control and other essential safety functions — that's right? Brian Naylor: That's right. We should say at the top, all the nation's air traffic controllers have been on the job and will continue to be. And there's no disruption in the nation's air traffic. FAA officials say safety is their top priority. The controllers are considered essential employees, and their jobs have been unaffected by all this. Montagne: And aside from the federal government losing taxes on this, what effect does this partial shutdown have? 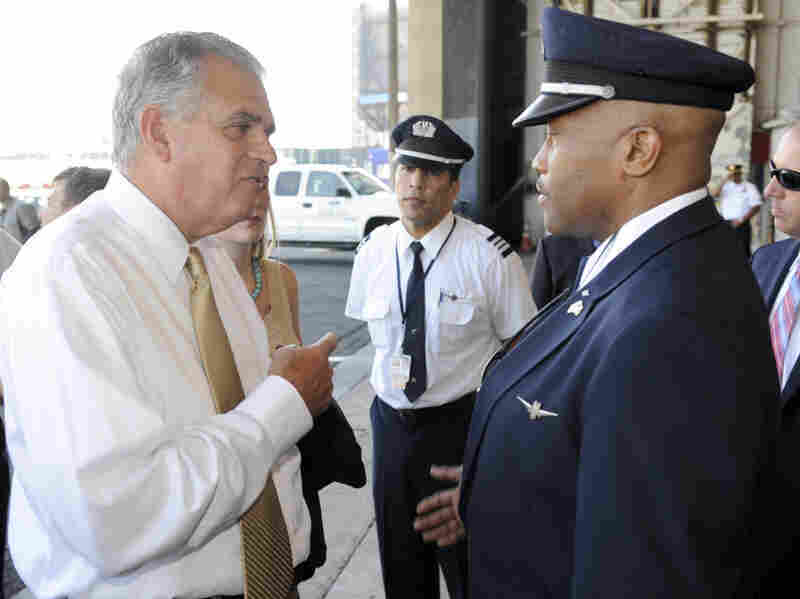 U.S. Transportation Secretary Ray LaHood (left) talks to American Airlines pilot Jesse Perkins after a news conference in New York on Monday. Naylor: It's been hard to detect by the average traveler. I think maybe [that's] one reason why this dispute has lasted as long as it has. There are some 4,000 FAA employees who are on furlough now, not collecting their paychecks. In addition, there are, according to the administration, about 70,000 construction workers who've been working on projects like runway extensions and constructing control towers — all of those projects have been put on hold, and so all of those workers have been idled by this dispute. So that's the biggest effect, but it's not something that a lot of people will notice. Montagne: And those airline ticket taxes going uncollected — could the government recover that money later? Naylor: No, that money is lost, never to be seen again — $30 million a day, maybe, as you said, over a billion dollars in lost revenues to the government should this dispute last into next month, as it may well do. Montagne: Give us some more details on the issues keeping the two sides apart. Naylor: It's complex. The FAA usually gets authorized several years in advance because, like the highway bill, a lot of these projects have long lead times. And the last authorization expired in 2007. And Congress hasn't been able to agree on a new long-term reauthorization, so it's passed a series of temporary reauthorizations — 20 to be exact. And among the reasons the two sides can't agree on a long-term measure is a provision House Republicans want to include — it would make it harder for airline and railroad employees to form a union. But they didn't include that on the last proposal for another temporary extension. What's gumming up the works on another temporary bill — and we're talking about a six-week extension — on the temporary bill, Republicans want to roll back a program called Essential Air Service, which subsidizes a bunch of small, regional airports. It just so happens those airports that would be cut from the program are in the states of some powerful Senate Democrats, including West Virginia Sen. Jay Rockefeller, who just happens to chair the Senate committee with authority over the FAA. Montagne: So it sounds like Republicans and Democrats are both involved, but who are the major players who don't want to make a permanent deal? Naylor: Well, it's Rockefeller and his House counterpart, Republican John Mica — they're the two key players. Mica's insistence on trimming back the air subsidy in any new temporary bill, and Rockefeller's refusal to buckle is what's keeping this from happening. Transportation Secretary Ray LaHood, who's a former Republican congressmen, knows both men well and has met with both of them, and I think is very frustrated that neither is willing to bend. And it looks like this dispute is going to continue into September before it's resolved. In the meantime, some 74,000 FAA employees and contractors won't be getting paychecks.